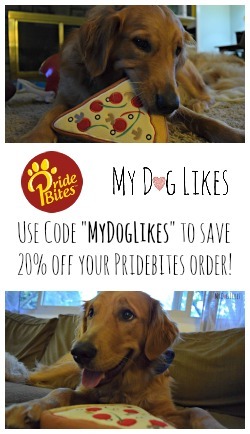 The spirit of giving is alive and well over at MyDogLikes! Wondering how “Santa Paws” ensures that our pups are surprised this holiday season? By making sure that all of those dog gifts are wrapped up nice and pretty! Unwrapping presents is lots of fun, especially if you have an enthusiastic pup to watch do it! We have met some pups that unwrap with laser precision. Unfortunately, as we recently found out, Charlie is more of a tear and chew kind of un-wrapper. He enjoys eating the wrapping, just as much as tearing it to shreds! As Charlie ate and tore away at his Christmas presents, we had peace of mind this year knowing that the wrapping was safe AND pet friendly! 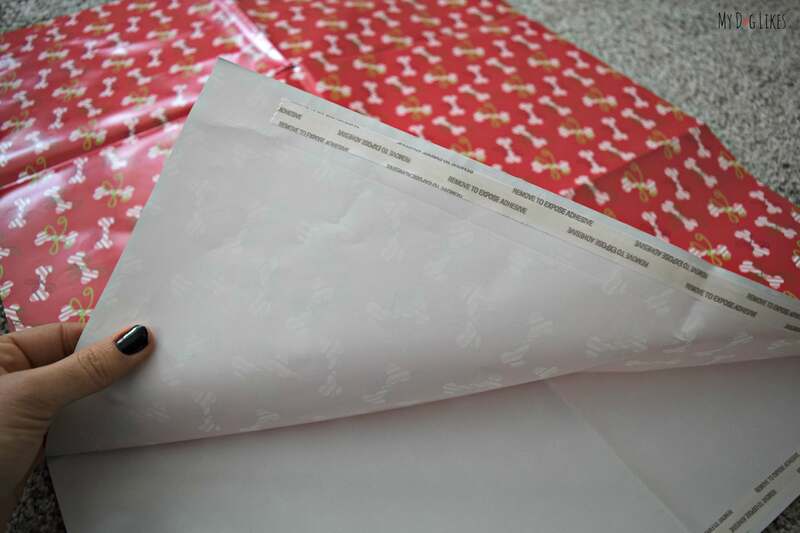 Though previously unknown to us, traditional wrapping paper is often treated with bleach and chlorine. In addition, the tape that we use to secure gift wrap can pose a choking hazard (and in the case of Max the cat who insists on eating tape, digestive upset). One holiday season in 2006, a man named Dave, was frustrated by the lack of playful, pet friendly gift wrap for his dog, Sami’s, gifts. Dave figured if he was having this problem, surely other pet parents were too. 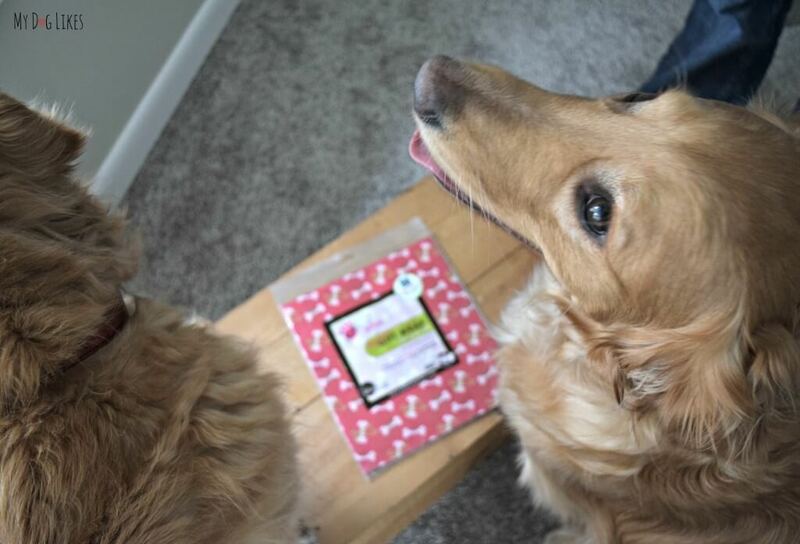 Dave shared his initial brainstorm for a pet-friendly gift wrap with his business associates, David, and Bob, who ultimately joined him in bringing this idea to market. DH2 International moved forward with the mission to offer sophisticated pet owners creative and playful pet-inspired designs while also offering a safe alternative to traditional gift wrap. After many man hours, DH2 International ultimately engineered a completely pet safe paper, ink, and adhesive. With your dog’s safety AND style in mind, Pet Party Printz Gift Wrap was born! What is unique about Pet Party Printz? Design – We loved the Rip-N-StickTM self-adhesive edge and the fact that it was right on the paper (attached with an easy to tear perforated strip). Pretty much everything that you need was right at your fingertips, which is great when trying to wrap in a house full of fur-friends! At initial glance, the Rip-N-StickTM edge adhesive looks questionable, after all I am used to using so much tape when wrapping. 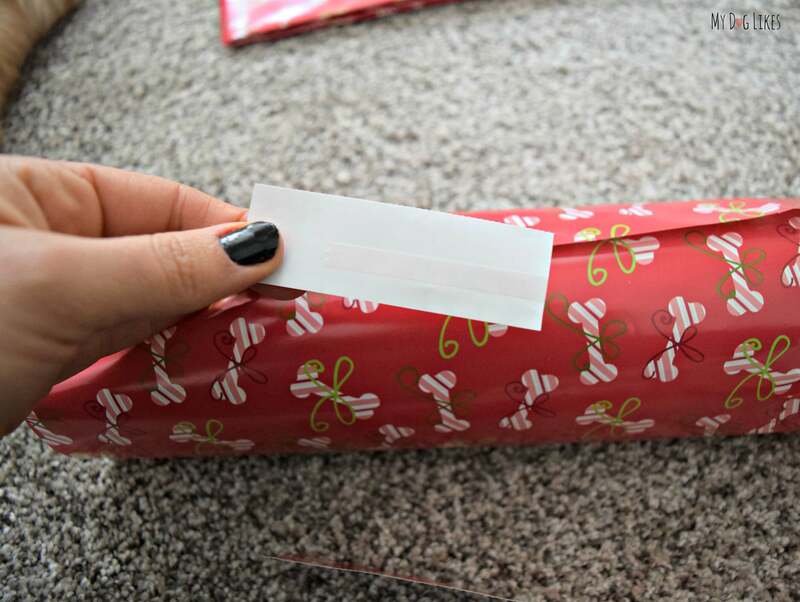 My fears were unfounded because what initially looks like a thin strip of adhesive, provided a shockingly strong connection and secure wrapping for our goodies. While you certainly can wrap things nice and tight with it, we also loved it when wrapping more irregular shapes, creating an “easy to tear into” pouch. Because the entire seam of the present is not covered with tape, it helps your pups find corners to sink their tiny front teeth into! Aesthetics – We love that Pet Party Printz offers a holiday, birthday, and everyday line of gift wrap. Giving gifts to your pup is fun year round and we see no reason why we shouldn’t have year round options to accommodate this?! Each of the gift wrap designs are fun, modern, and playful! Safety – We love products that also increase our knowledge and awareness. We didn’t know that bleach and chlorine were used to make most commercial wrapping papers that crisp white color. For us humans, it’s not such a big deal, we don’t tend to eat the paper our gifts are wrapped in! Our pups on the other hand, love to eat the gift wrap. We feel that if there are safer alternatives out there, why not use them? We have seen firsthand that tape is a choking hazard, and when consumed, can cause stomach upset (Max always throws up after eating tape). Pet Party Printz offers fun, high quality, pet themed and pet friendly wrapping for year round fun. 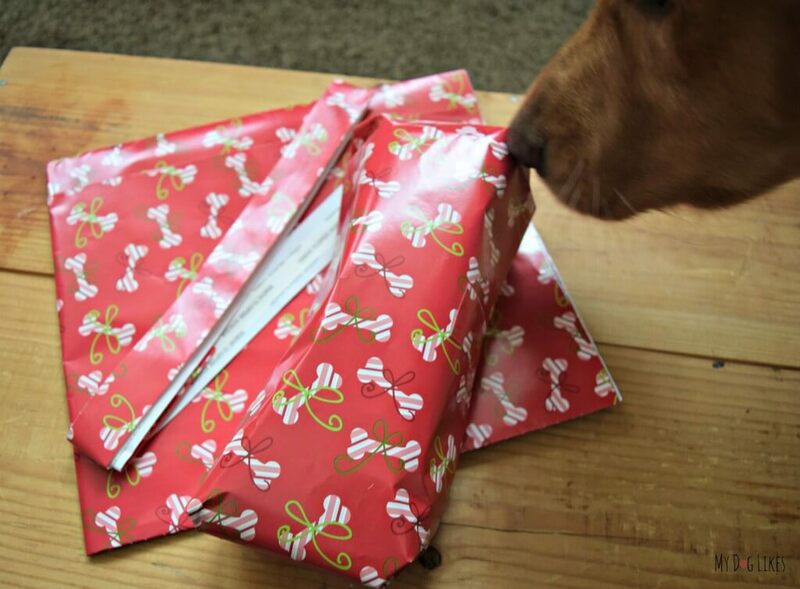 Whether you are giving gifts or simply want something to entertain the pups for a few minutes, the act of unwrapping ANYTHING provides tons of fun! We were totally unaware of the potentially dangerous chemicals (chlorine/bleach) that are used to make the crisp white of many commercially available wrapping papers. Now that we know, we see no reason not to use this fun and stylish wrap. 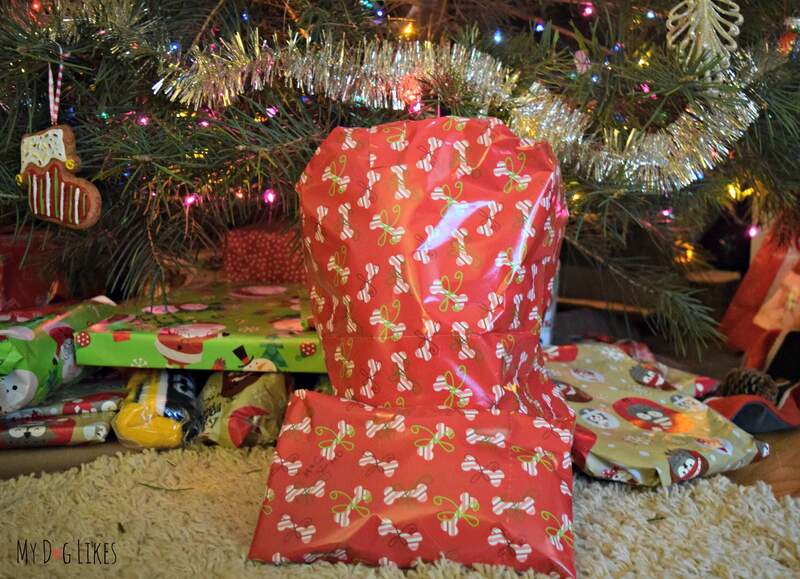 The paper was easy to use (as easy as wrapping is with 4 animals in the house) and the Rip-N-StickTM adhesive was not only convenient, but held on tight! 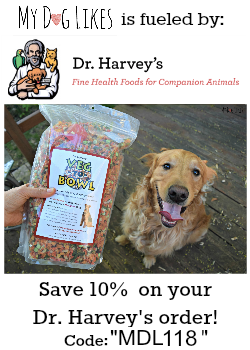 If you like to treat your pups to some unwrapping, this is a fun, safe, and convenient thing to have around the house! Don’t forget about the pet lovers in your life too. The patterns are cute and modern; I know a couple of my dog-lovin friends would like to see their gifts wrapped in it too! Interested in giving Pet Party Printz Pet Safe Gift Wrap a try? Click here to shop Pet Party Printz on Amazon! What a GENIUS idea! This is brilliant!!! We were excited that Charlie was an unwrapper! Harley wont come near it….Too sophisticated I guess! Thanks for stopping in! Glad you know about it! We think the patterns are adorable! What an amazing post about a brilliant idea! I was just commenting (on another blog) about how I purposely didn’t wrap Harley’s gifts this year. Now that I know this exists – I can be ready to wrap in a flash next year. Too bad it doesn’t come in edible flavors – we’d get two for the price of one! Thanks so much for sharing. Thanks so much! It really is easy to use and I bet Harley would be really into it! He’s got a bit of mischief in him!! 🙂 Edible flavors…you may be onto something there! We leave gifts for the boys mostly in stockings- they have never shown an interest in ripping the paper even when there’s tasty treats inside so stockings have worked best for us! We get it Kaitlin-There is no way that Harley (our older golden) would ever unwrap, despite our best efforts! I think some dogs are into and others are not! Thanks for stopping by either way! I love Charlie. So funny. Such a dog, isn’t he? lol I didn’t know that paper had bleach and chlorine in it either. That’s really good to know. Thanks for the opportunity to win better paper for dogs (and cats). Take care! He is certainly a puppy-brain…. :) Good luck!! I put the dogs’ gifts in gift bags this year with tissue paper on top, just because it seemed simpler. But when I was opening my own gifts from my hubby they really wanted to help me open! I didn’t know that the paper had bleach and chemicals in it – yuck. This is a really great idea, and I love the colorful papers. I was actually looking for some pet themed paper this year when wrapping something for my sister’s pet – so this would be great! We had no idea. When we spoke with a rep from the company they shared that they typical process for getting that bright white paper is with lots of unsavory chemicals!! PS. Charlie enjoyed the bag with tissues paper as well…then thought that every present was his! Awesome! I want to see some pics of these unwrapping pups I am hearing so much about! What a great idea. And cute paper! That’s so great! Why shouldn’t pets have fun unwrapping gifts as well? Right? They seem to like the surprise of it all too! Jennifer we had no idea that the other paper WASNT safe for them! Now we do! The paper is so think and high quality, Charlie really enjoyed himself! That is cool, never heard of it before! Some human really had their thinking cap on with this stuff. Do you like to unwrap Emma!? Humans may of thought of it, but its dogs like you who inspire them! I have a 10 week old puppy and he likes to open everything. He was quite the help on christmas morning. It didn’t matter if it was his present or not. I haven’t tried to wrap her a gift for her to open yet…. Yes, clean-up is a must. Otherwise the furry vacuum cleaners with teeth come and eat it up! I have eight dogs, including three rescues. The rescues are a sheltie, a long hair chihuhua and a pit bull. The rest of the dogs are all Shelties….While the pit bull and the chihuahua look at wrapped presents in confusion, and the chihuahua will proceed to eat the paper along with whatever is in it, the Shelties are a different story. They LOVE unwrapping presents and KNOW which packages are theirs under the tree and I’ve caught one of them many times over the years stealing a wrapped gift to open. on their bdays when the gifts are focused on just one at a time, they get even more excitd to open their presents. Wrapped stuffed squeaky toys are the absolute favorite to unwrap here and somehow are also the ones that are sneakily stolen almost always from under thr tree as well! They sound like so much fun at the holidays! You HAVE to get this on camera! Yes he open them and play with the box. My dog loves opening gifts! This would be perfect for her! This would be for my sister’s dogs. Yes, they open gifts and like to eat the paper so I’m sure she would love that they will not get harmed by this wrapping paper. She just recently had to take them to the vet because of a violent reaction to something they should not have ingested. Oh no! I hope they are doing ok. Not sure what size it was, but having hydrogen peroxide around the house can be helpful to get something up that shouldnt have gone down! It sounds like your sister could really use this! Oh, yeah. Our dogs have always liked opening gifts, except for one of them. She was a bit too timid and would let her big sister do it for her. Our current pooch likes bubble wrap (she steps on it to make it pop) so we wrapped this years gifts in bubbles for her. That is SUCH a good idea! Charlie would probably love that….as soon as he was done being scared! No she pushes them around with her nose and I help her open! So the next step is to make sure they know what the right stuff to tear up is!! Silly pups! He would only open a gift if he smelled food inside of it! His or anyone else’s food! Ha, so true! How funny!! 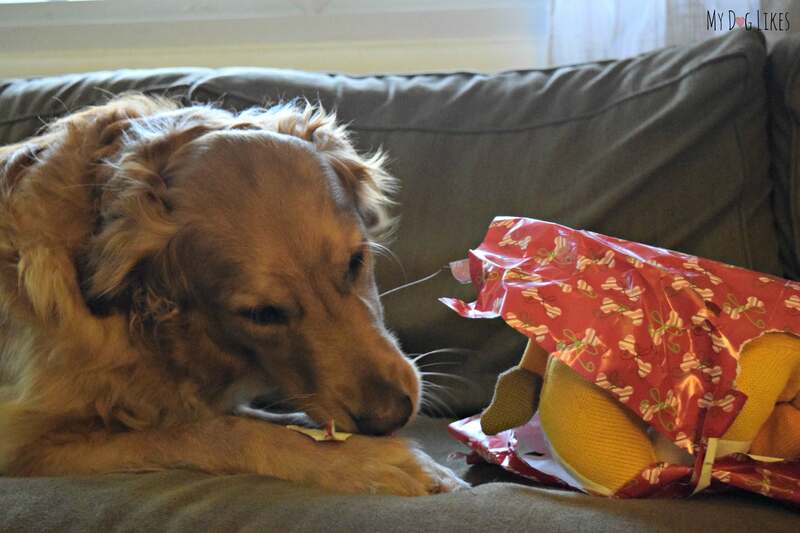 Queenie the Border Collie opens her own gifts — the other 2 dogs need a little help. We can’t any of the dog toys under the tree early — Queenie can smell the rubber and will sneak the gifts and open them early. Yes, even when they are not his. yes will tear the paper like no tomorrow! They get gifts, but I don’t think I’ve ever had them open them themselves… bet they’d love it though! My dog does not open gifts by himself. Well I don’t have a dog personally, but I get gifts for my neighbors dog all the time. Her dog does, in fact, open gifts. Often. I spoil him rotten. Hehe. I have a mini pincher names Elvis who will be 4 January 29th and a part Schnauzer part cocker names Winnie and she turned 10 last month and they both open gifts and get so excited! Yes. We always make sure to have one gift for each one of them that they can open. They love it! Our dog is an excellent paper shredder so opening gifts is not a problem. Artie loves to discover what toys are treats are hidden inside the boxes we wrap.